I’ve taken five encaustic workshops with Andrea Bird and, in each class, there is always someone who hasn’t learned this technique. Everyone has the same wonderful reaction as the paper comes away from the wax and the ink is left behind. OR dip a cotton ball in nail polish remover and rub it on the back of the transfer. The paper will start to wrinkle when it has separated from the toner. Instead of dissolving the paper by rubbing you can just pick up one corner and peel it away from the painting leaving the toner on the wax. SAFETY PRECAUTION! If you use nail polish remover wash it thoroughly off before fusing. If the transfer is on the top layer you can just gently fuse, you don’t have to put a top coat of wax. Fusing will meld the wax and any paper that is left on the surface of the wax. . If you fuse with a blow torch use a dip in and pull away motion to lightly fuse. If you use a heat gun, keep it moving and don’t go too close to the surface of your artwork. An embossing heat tool is a lower temperature heat gun and you may have more success with it. Stop before the image begins to distort. 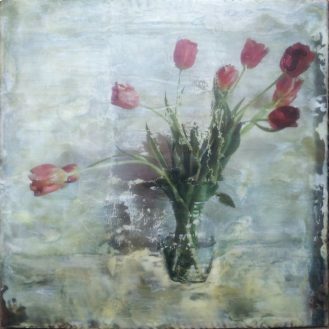 If you want a hands-on demonstration, check out encaustic workshops with Andrea Bird. Thing i’m having trouble with, the image is not at all sticking. Does it matter the type of wax you use to put the image on? Do I need to break down and buy damar resin? Marcia you need damar resin to make encaustic medium. Beeswax alone is just not durable enough. The addition of damar resin acts as a hardening agent allowing your painting to cure and will reduce or prevent blooming (a white clouding of the surface). You need the image to be printed with a laser printer – ink jet won’t work. Following your wonderful instructions, transfers of my photos onto the wax medium is working very well. However, after the transfer is complete, I lightly fuse the transfer. Later, if I want to put a top layer of wax medium over the photo — it blurs and the toner spreads, ruining my image. What am I doing wrong?